You are here: Home / Great Deals / Amazon Deals / 10 Bracelets Under $5! I’m always on the lookout for inexpensive and cute jewelry. 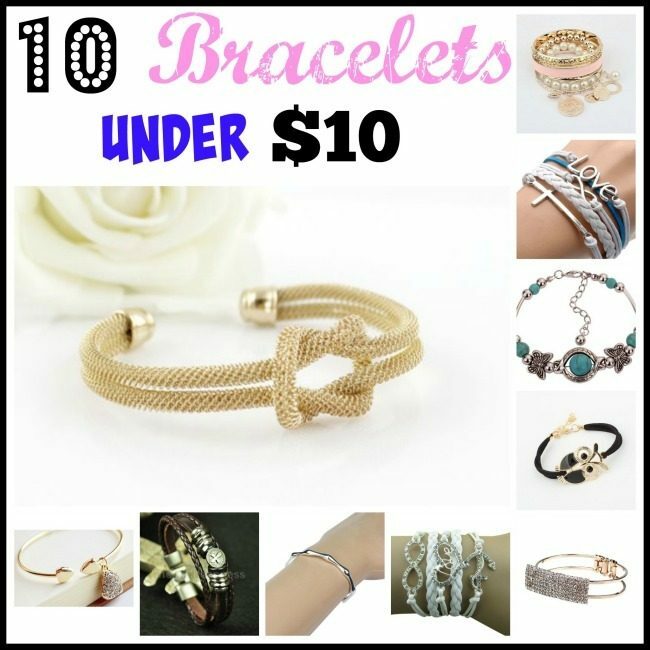 If you’re like me, you’re going to want to check out our list of 10 Bracelets Under $5! These would make fantastic gift ideas and stocking stuffers for the holidays as well! Vintage Silver Infinity Love Cross Leather Rope Bracelet – $1.06 + FREE shipping! Gold Crystal Cuff Bracelet – $1.54 + $1 shipping! Sterling Silver Bamboo Joint Bracelet Bangle – $1.78 + $1 shipping! Rhinestone Infinity Love Anchor Bracelet – $1.99 + $1 shipping! Owl Leather Bracelet – $2.01 + FREE shipping! Rhinestone Heart Bangle Bracelet – $2.06 + FREE shipping! Tibetan Green Turquoise Butterfly Bracelet – $3.05 + FREE shipping! Pink Coin Pearl Bracelet – $3.69 + FREE shipping! Men’s Metal Cross Studded Surfer Leather Bracelet – $3.78 + FREE shipping! Gold Tone Love Knot Mesh Cuff Bracelet – $3.85 + FREE shipping!